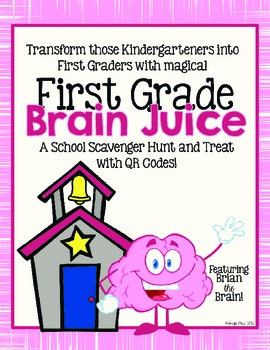 Brian the Brain will lead your students through a fun Back to School scavenger hunt to familiarize your students with important places in the school. 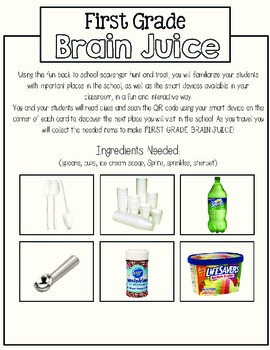 While solving Brian's fun riddles students will collect the ingredients to make FIRST GRADE BRAIN JUICE! BONUS: This product contains QR Codes to be sure you are on the right track! When students return to the classroom they will sequence the places they traveled using the pages provided. (This allows time for teacher to prep Brain Juice). Click on the preview to see what's included. PLEASE NOTE: This product is licensed for single user/single classroom use only. If you are interested in obtaining a multi-user license, please do so when you purchase the product. It is not okay to mass distribute this product without obtaining the correct number of licenses. All educational activities found within this pack are the intellectual property of Angie Neal ©2015.